← How Do I Move From Anxiety to Peace? We live in a consumer society. Malls stand like cathedrals on the edge of cities, promising a deep religious experience to the faithful weekend worshipers. We are encouraged to be consumers and our economy is based on production for increasing consumption. 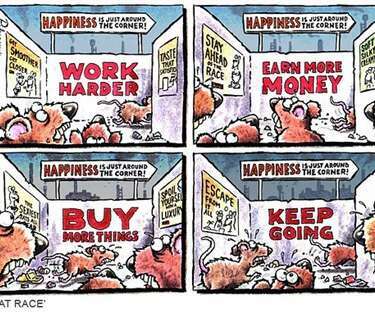 The problem is that a consumer society consumes us. It reduces us. It manipulates us. It persuades us to place value in money and possessions and these misplaced values sap our energy and corrode our joy. Here are four ways to find peace in a culture of 24-7 production and consumption. Rather than focusing on what we don’t have, it is good to take an inventory of what we do. It is helpful to pause and show gratitude for our many blessings and comforts. Simple Living has become a hot topic in communities which focus on wellness or wholeness. The Hebrew term shalom refers to the peace associated with wellness and wholeness. Simple Living encourages people to break with the ties to their many possessions and their large bank accounts. Cars, TV’s, large houses, huge yards, and multiple investments all require servicing and management. People with little can be joyful that they don’t have to maintain their boat, their snow-mobile, their lawn-tractor, and their cabin by the lake. A compulsion to have nothing can be as damning as a compulsion to have it all. Sometimes we are blessed with an inheritance of great wealth or a multitude of possessions. It has been said many times that the average American is very wealthy when compared with the rest of the world. Those of us who live in America have larger houses, some disposable income, and our own private modes of transportation. We are so ignorant of the way the rest of the world lives that we consider our own standards of wealth as the norm. Should we then heap shame and guilt on ourselves or on our neighbours? That isn’t the path to freedom. The path to freedom is to hold our wealth with an open hand. We can share what we have with our family and communities. Wealthy benefactors can host events, use their possessions to enrich the lives of the disabled, or employ maintenance staff and service staff. In summary, there is peace in letting go of both the felt need to have more and the felt need to have less. My son broke my 3-D Flat screen TV. He threw a metal airplane into the sky and flew it into the screen. It broke in many places. The cost to replace it was prohibitive and so I lost my ability to play 3-D movies. I simmered for a few days before a student, Jordan Grusy, called me to task for my attitude. He asked me if my TV was more important than my son. I had to admit I was behaving as if the TV was more important. I went home with a changed heart and treated my son much better. Are things more important than people? Having small children will teach you not to get too attached to nice things. Over the years we have had to choose loving the children over our love for antique plates, solid wood tables, glasses, and an heirloom desk from my Grandmother. Communism! Isn’t the redistribution of wealth one of the basic tenets of communism? Well, yes. However, in communism the government decides what to take from the wealthy and redistributes it in ways that they see fit. Communist governments have been inefficient and corrupt, growing the bureaucracy to a monstrous size. In too many cases the people have become indolent, expecting the government to pay them in spite of their inactivity. The generosity of the poor in Pakistan taught me a huge lesson in this area. They lavished hospitality on me, as their guest, despite their lack of wealth. I could see clearly the virtue in giving, especially when I saw the joy these people had in serving me. I now feel compelled to literally pay it forward. These thoughts are pulled from the last chapter in the biblical book of Philippians. Paul deals extensively with money in that chapter. Even in the ancient world wealth was a major issue. Some people have mis-read Paul in such a way that they believe Paul teaches a health and wealth gospel. The ‘Prosperity Gospel’ mistakenly teaches that if you give a dollar to God he has promised to give you $100 in return. The meaning of the passage is really one of giving up trying to establish your own security and God will provide what you need to endure the many hardships coming your way in life. God is the ultimate value for the Christian and all resources come from God. We accept God has given us just the right amount of resources to do whatever he has called us to do. Money is not our God or our object of worship – that role is already filled.